Across Seasons Three and Four of Star Trek: The Next Generation, the series delivered its first-ever cliffhanger via ”The Best of Both Worlds. This double-episode became quite popular and inspired the series’ producers to try again in each of the following seasons. At the very start, Vice-Admiral Nechayev (Natalia Nogulich) abruptly relieves Captain Jean-Luc Picard (Patrick Stewart) of his command of the Enterprise. It looks like the Cardassians may make an incursion into Starfleet territory, and the Vice-Admiral wants someone with more Cardassian experience at the helm of the flagship as they enter negotiations. She replaces Picard with Captain Edward Jellico (Ronny Cox), a brusque and hard-driving leader who actively irritates much of the ship's crew. In the meantime, Picard, Dr. Beverly Crusher (Gates McFadden) and Lt. Worf (Michael Dorn) all go on a dangerous espionage mission to obtain more information about the potential development of metagenic weapons by the Cardassians. Chain follows the developments that surround these events. Along the way, the program takes a few unexpected turns, mainly in the way it treats some of the characters. However, the show suffers from a moderate sense of déjà vu, especially in the manner it reminds me of The Best of Both Worlds. Chain provides a stimulating episode for the most part, and it definitely feels interesting to see someone else in the captain’s chair, but it falls short of becoming exceptional. Trivia note: David Warner remains one of a small number of actors to play multiple roles – and species – in the Trek universe. He portrayed a human in Star Trek V: The Final Frontier, a Klingon in Star Trek VI: The Undiscovered Country, and a Cardassian here. This ties him with Mark Lenard for second place on the list. (Best known as Spock’s father Sarek, Lenard also acted as a Romulan commander in an episode of the original series as well as a Klingon in Star Trek: The Motion Picture.) Coincidentally, Lenard appears in Season Six’s other two-part show, Birthright. 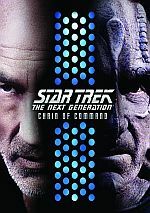 Star Trek: The Next Generation: Chain of Command appears in an aspect ratio of approximately 1.33:1 on this Blu-ray Disc. This was a pleasing presentation. I’ve always felt pleased with prior TNG remixes, and the DTS-HD MA 7.1worked well. The soundscape favored action enough to give it a solid sense of life and environment. Much of the material focused on general ambience, but the track kicked into higher gear when necessary, and that left us with some exciting action sequences. Those delivered well-placed material that moved around the spectrum in a smooth, vivid manner. The disc throws in a few extras, most of which are exclusive to the Blu-ray. We get an audio commentary from actor Ronny Cox, director of photography Jonathan West, and scenic artists Michael and Denise Okuda. All four sit together for this running, screen-specific look at cast and performances, cinemtography, story/character areas, technical details and related subjects. Overall, this is a pretty good track, though it’s not one of the better TNG commentaries I’ve heard. I suspect it would’ve sounded better if I’d not listened to it right after I played the three TNG Season Six chats; those were all excellent, so “pretty good” pales in comparison. We do get a decent look at Chain and connected topics, but I don’t think the discussion ever takes flight. A new featurette called The Privilege of Rank lasts 28 minutes, 35 seconds and offers info from Cox, producer Ronald D. Moore, supervising producer Frank Abatemarco, and actors Marina Sirtis, Natalija Nogulich, and Patrick Stewart. “Rank” looks at story/character areas and the choice to make a two-part program, cast and performances. It doesn’t give us a deep take on the show, but it offers a mix of nice notes. In addition to episodic promos for Chain, we find eight deleted scenes. These fill a total of 13 minutes, 29 seconds, the vast majority of which accompany Part II of Chain; only one short sequence comes for Part I. Most of the added scenes focus either on Captain Jellico or Gul Madred. These offer some decent material – like a change in First Officer – but I don’t think anything memorable shows up here. Still, I’m always happy to check out cut footage. 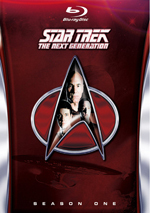 The disc opens with ads for Next Generation Season Five and Season Six, Next Generation: Unification and Enterprise Season Four. While I wouldn’t call Chain of Command exceptional Trek, it offers a pretty solid two-part show. The segments get edited together to make one satisfying program here. The Blu-ray gives us very good picture and audio along with some interesting bonus materials. 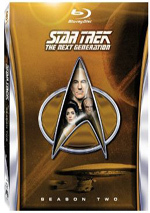 Unless you’re dying to see the supplements, fans who own the Season Six Blu-ray set won’t need this release, but more casual Trekkies will get something out of it.